We turn our focus back on Mr. Smith in this volume, as he and his guide continue on their road to Ankara. As they skirt the Aral Sea, they are led to a fishing village by a lively pair of twins named Laila and Leily. They are of an age to marry, but their father hasn’t gotten started on making them a match yet! Since they know the kind of men they want, they decide to take their nuptials into their own hands – which, more often than not, gets them into trouble! Meanwhile, Pariya’s father has met with the father of a boy that has taken an interest in her! Pariya is extremely nervous – she likes the boy as well, but won’t her forceful personality scare him away, just like all the others? I cannot overstate it – I adore this manga. The illustrations are so lovingly detailed, and really ground you in the setting. The only thing I didn’t like about this volume were the introduction of the twins. Their comedic relief was a bit overdone for me. The leisurely pace is still a big draw for me. Even if I wish we would meander back to Amir and Karluk at some point, the journey is still worth it. Mori, Kaoru. A Bride’s Story (Vol. 4). 2013. After travelling the world, working with the military, bringing peace to all, Wonder Woman could use a little down time. The perfect opportunity arrives when Etta’s brother is getting married, and Etta could use a plus one. When a bomb is uncovered at the reception, however, it looks like business as usual. There are some who think that Diana’s blood – her Amazon DNA – could make them strong, make them a hero. There are others who think that her blood could cure countless diseases. And still others want her blood to make an army. Whoever they are, they used Diana’s friends to get to her – and Diana is out for blood herself. This is the first volume that Shea Fontana wrote. I didn’t find it quite up to par with Vols. 1-4, which Greg Rucka wrote. Those are undoubtedly some hard shoes to fill, but I just didn’t find the same emotional resonance in this volume as in Rucka’s work. This volume is a lot more action-oriented. I found myself struggling with the DNA plot point – Diana’s powers are blessed upon her by the patrons, not as a result of any superhuman gene. It doesn’t make sense for anyone to WANT her DNA. I found it difficult to suspend my disbelief for this one. The artists varied from issue to issue – which is really just a personal nitpick as the art was all great =P My absolute favorite continues to be Jenny Frisson’s variant covers. They’re! Just!! So!!! GREAT!!!! I LOVE THEM!!!!! Fontana, Shea, Mirka Andolfo, and David Messina. Wonder Woman (Rebirth, Vol. 5): Heart of the Amazon. 2018. Two years ago (has it been that long?!) I wrote my first post about playing Pokémon Go as an adult. At the time I justified it, for all three of my children played it as did many of youth at the library I work for. But my children have all quit, yet I am still playing. I am the only Mom out there who wants her kids to play, and was sad when they stopped. For 2+ years I have consistently played this game- which is quite shocking even to me- as I have never been much of a game player. I played some Pac-Man in my youth, and I’d play Mario Cart or Wii games with my kids, but I never saw the appeal in video or handheld games. Until now. I seriously can not stop. Once they introduced the incentive of earning extra points if you played consecutive days, I knew I was hooked. The game amuses me to no end, like when I find a gym that players have filled with all of one type of creatures- just for fun. This one was filled with all flyers. A point of pride for me is that I have never spent a dime on this game. You can buy “coins” that let you purchase more tools to help you in the game, or even to buy your avatar more clothing. Since I’m embarrassed to even be playing this game at my age, I’m certainly not going to spend money on it. I like to pat myself on the back and tell myself my game play is more authentic that way. I have been planning on writing this post for awhile, but I set a goal for myself to catch the elusive Mew first. I did so through “A Mythical Discovery” that had gamers compete eight multi step challenges to earn the right to catch the legendary Mew. One step took me forever to complete. Kathleen who also plays sent me a funny message with a screen shot she took of a glitch in the system that showed me catching a creature that at that time I had not captured yet. During my recent family vacation, I finally completed that last excellent throw and captured the little bugger. I actually squealed and shouted out to my family about my success. They were not as impressed as they should have been. All this effort for a pink little cat/mouse hybrid thingy. I have no plans to quit and am quite excited that next week a new quest is being released that will set me on a new journey to nab the new legendary Celebi. It just goes to show- that you never know what game (or book) will appeal to a person. So, I gotta GO, and catch me some more Pokémon! Header picture is from the website Game Replays. In a world where all magic disappeared with the Guardians and their Khats, a young girl starts to exhibit the old signs. Not many people remember, but her mother remembers the stories. The Queen Drucilla remembers: she’s the one who killed them all. She is rooting out anyone who, like Rose, starts to show signs of magic, and she’s not discriminatory about who else she kills. Rose’s entire village is eradicated, leaving her devastated, angry, and out for revenge. Once she meets her Khat, marking her as a Guardian of the realm – all bets are off. I found the story pretty generic. It’s that classic high fantasy coming-of-age story, with the typical characters to match. The thing that bothered me the most was the Queen herself: all evil, no questions asked, with stereotypical dark skin. The art made the writing bearable, though. It was lush and detailed, like the prose of my favorite fantasy novels. It’s an okay addition to the fantasy graphic novel genre, but those who prefer more finesse in their writing might want to look elsewhere. Finch, Meredith, and Ig Guara. Rose (Vol. 1). 2017. Other People is two beautifully told stories about family and community relationships, with spot on character studies. The first story, Days of the Bagnold Summer, is an in depth look of a summer between a mother and her teenage son after his plans to visit his father in Florida fall through. Set in a small British town, Sue and Daniel uneasily move through their days, with Sue trying to connect with her metal-head teenager. Daniel skulks around home, not truly upset about not making the annual trip to visit his father and stepmother, but not wanting to admit it to his mother. Six weeks pass, with Daniel slowly gaining some insight and empathy towards his mother, who does her damndest in trying to prod him lovingly in the right direction. Their interactions were so true to life, and the conclusion with the two of them heading to a family wedding was sweet. I connected with this story at many levels, as Sue is shown at the library she works at, and as a librarian myself, I laughed at some of the observations she made about patrons there. But it was a mother trying to relate to her teen that was the most poignant for me. Actually I am a mother to three teens- and believe me, there are days that are hard with them. I had so much compassion for the character of Sue and I wanted to shake clueless Daniel, although at heart he wasn’t a bad son. I look forward to the movie they are going to make of this story. The longer second story, Driving Short Distances, was another character study, this time between Sam and his boss Keith. Sam is 27 and at a crossroads in life, as he failed out of university and had a breakdown; so Keith, who is a distant relative of the family, takes him on as a sort of an apprentice in his distribution and delivery business. That Sam truly never figures out what Keith does on his endless errands is a running gag. Keith’s false boasting and foibles become evident as Sam is stuck in the car with him for hours a day, but Sam becomes more confident as the story progresses and he knows he has to stop being carried about in the current and grapple with making himself a new life. The story is a sort of love letter to small town life, as Keith and Sam interact with the same residents day in and out, and I laughed out loud several times. By the end, you are aching for both men, as this tender story shows how toxic masculinity can prevent men from really connecting with one another. 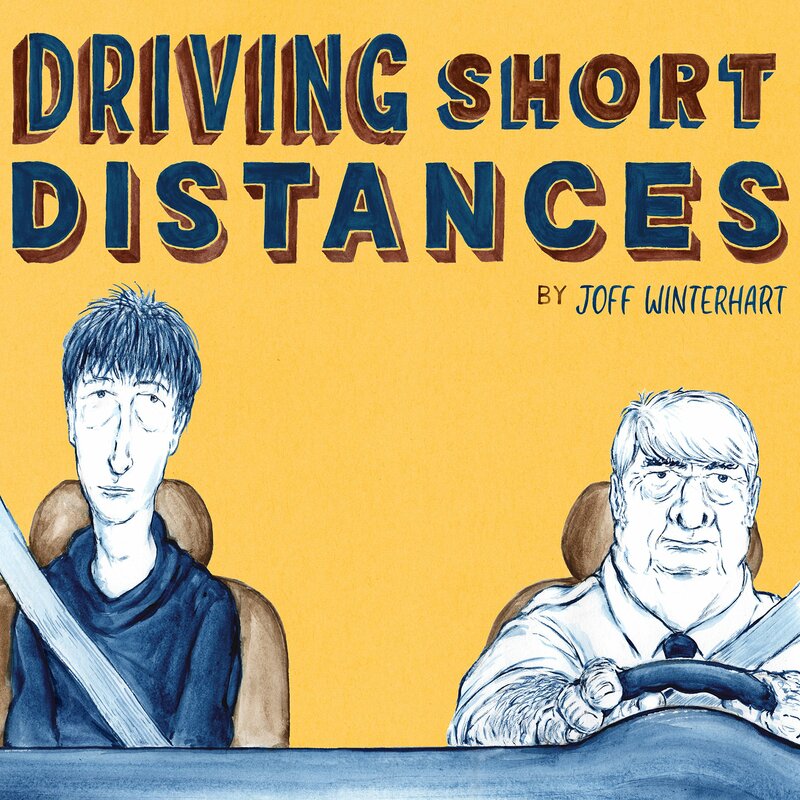 Author Joff Winterhart really captures the frailties, oddities and connections between people especially in small communities where people have known each other and their families for generations. His sketchwork captures the essence of people, warts and all, drawn in black and white with excellent shading. His blue overwash in the second story hints towards the depression that both men exhibit, showcasing that Winterhart’s deceptively simple looking artwork is quite effective. I am thankful to NetGalley for bringing to my attention this graphic novel and it’s charming stories. One night, a girl appears in the forest, dancing on the lake. The animals have never seen her before. She’s a ghost, but undoubtedly human – probably best to leave her alone. Wise Owl thinks she looks confused and scared, so he goes to talk to her. The girl can’t remember a thing about what happened to her, and she is grateful for Owl’s help, but confused too. She does remember that people don’t go out of their way to help others. Owl doesn’t think that’s true. Eventually they find a house, with a young woman inside, defending it against a man who wants to take it from her. What is the Ghost’s connection to this place? Can they help the woman who currently lives there? This was a unique read. Let’s start with the layout. There are no panels like in a traditional graphic novel. Instead, the whole page is one big illustration, in what appears to be watercolor and colored pencil, with speech bubbles peppered throughout. Sinuous brushstrokes move softly through the pages and gently guide the reader from one speech bubble to the next. I read it twice (it’s very short) just to study the art and how it connected the text in such a subtle, non-invasive, yet wholly pervasive way. I am in thrall of the masterful craftsmanship that went into this graphic novel. The Ghost, the Owl (pg. 5). The story was pretty open-ended. Enough is explained so the reader is placed appropriately in the story, but just enough is left out so the reader is left to draw their own conclusions about various elements, including the ending. I could recommend it to a variety of age groups. I enjoyed it immensely as an adult, but I would easily give it to a middle-schooler because of the short length and the discussions of selflessness and man vs. nature that could start with this book. High schoolers could talk about more of the same, but would better appreciate the folklore inspiration for the story and the open-ended writing. Beautifully rendered and highly recommended. Franco and Sara Richard. The Ghost, the Owl. 2018.